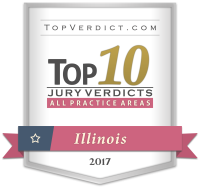 Voted “Best Law Firms” by U.S. News! Whether an accident occurs on an airplane or a helicopter, any type of collision that happens at a high altitude can result in serious injuries, or even worse, death. If you lost a loved one as a result of an aviation accident, it is important to take legal action in a timely manner to help determine liability. Our team at Power, Rogers & Smith, L.L.P. is able and available to answer your questions and to effectively advocate for your interests. Aviation accidents are a complex area of personal injury law that we have prosecuted with skill and success for years. You can rely on our personal injury attorneys in Chicago to provide the counsel necessary to help you. We have an exceptional level of experience in cases involving aviation accidents. Our attorneys can protect your rights. Call Power, Rogers & Smith immediately if you've been injured in an aviation accident, or suffered in-flight injuries. We have 30+ years of experience! In Illinois, victims of personal injury have two years from the date of the injury to file a claim, while families who have lost loved ones wrongfully also have two years from the date of death to file a claim (735 ILCS 5/13-202). If you were injured on a plane, or in an aviation crash of some sort, contact the Chicago aviation accident attorneys at Power Rogers & Smith quickly, because time is of the essence in these claims! When negligence plays a part in an aviation accident, legal action is a possibility. As the family of an aviation accident victim, you can file a wrongful death claim on behalf of your loved one. Nothing can bring back your lost loved one, but seeking monetary compensation can help deliver justice and help you bear the financial burden you may be facing. Our attorneys understand the process of investigating aviation accidents. We are familiar with the various regulations and procedural requirements at the federal, state, and international levels of investigating and reporting plane crashes. Our team understands how to protect your rights and interests. We have recovered over $4 billion for our clients over the years. With more than three decades of experience and a reputation for excellence in advocacy, you can depend on us to serve your interests and to protect your rights. Whether your case goes to trial or not, we're prepared to advance your rights and maximize your verdict or settlement. The National Transportation Safety Board was established in 1967 to investigate all aviation accidents in the United States. The NTSB is an independent agency that has no regulatory or enforcement power but is primarily responsible for investigating civil aviation accidents throughout the country. If the incident takes place outside the U.S., the investigation is primarily handled by the country the plane was in at the time. Aviation accident investigations can take months, although sometimes they can be resolved in a matter of weeks. Since the NTSB was established, it has investigated more than 132,000 accidents. According to the NTSB, in 2013, the most recent year from which data is available, there were 1,298 total aviation accidents in the United States. 236 of those were fatal crashes, resulting in 429 fatalities. The year prior, there were 1,537 total aviation accidents in the United States, 280 of which were fatal, resulting in 449 fatalities. Aviation accident rates decreased from 2012 to 2013 by 239 accidents. Learn how we can help! Call (312) 313-0202 for your free case evaluation. Our Chicago airplane accident lawyers have handled product liability cases against Boeing Aircraft, Airbus / EADs, Beech, Cessna, and others. Attorney Todd Smith is a chairman of the Aviation Section of the American Association for Justice, formerly the Association of Trial Lawyers of America. He has achieved multimillion-dollar judgments and settlements against the Federal Aviation Administration in air traffic control cases. In 2015, Attorney Todd Smith of Power, Rogers & Smith, L.L.P. achieved an $18.85 million award for clients injured in an aviation accident involving a defective product. In addition to smaller airplane and helicopter accident cases - including the recent Illinois Supreme Court case Russell v. Augusta Aerospace, et al. - we have been involved in the majority of the big commercial airplane disasters over the years. Aviation accidents aren’t always catastrophic crashes. Sometimes, passengers are injured while on planes. These are commonly referred to as in-flight injuries. These can be caused by excessive turbulence, seat malfunctions, oxygen mask malfunctions, and failing to respond to emergency medical situations, such as heart attacks. Trust in Power, Rogers & Smith, L.L.P. At Power, Rogers & Smith, L.L.P., our team of Chicago aviation accident lawyers works hard every step of the process. We know how these situations are investigated and we know how to prove liability. We take the time to formulate a case strategy based on the facts and details of your individual case. Our team has helped recover more than $4 billion for our clients over the course of our 30+ years of experience. We have a reputation for offering strong, reliable legal advocacy and we aim to help you through negotiations or trial. Don’t hesitate to learn more about your rights and legal options. What Should I Do If I’m in an Airplane Accident? A: Aviation law is complicated. If you’ve been involved in an airplane accident call an attorney as soon as possible. it’s imperative that you seek an attorney who has experience in these types of cases. A: Yes. Airplane accidents require sophisticated investigation skills to uncover who’s at fault for your injury. An experienced attorney will know how to navigate the legal aspects of your case to ensure you are taken care of. A: If you’ve been involved in an airplane accident, it’s imperative that you retain legal counsel that has extensive experience in aviation law.